For folks who fear nodding off on the job or during class, the team at Blanc believes their smartwatch can solve the problem. 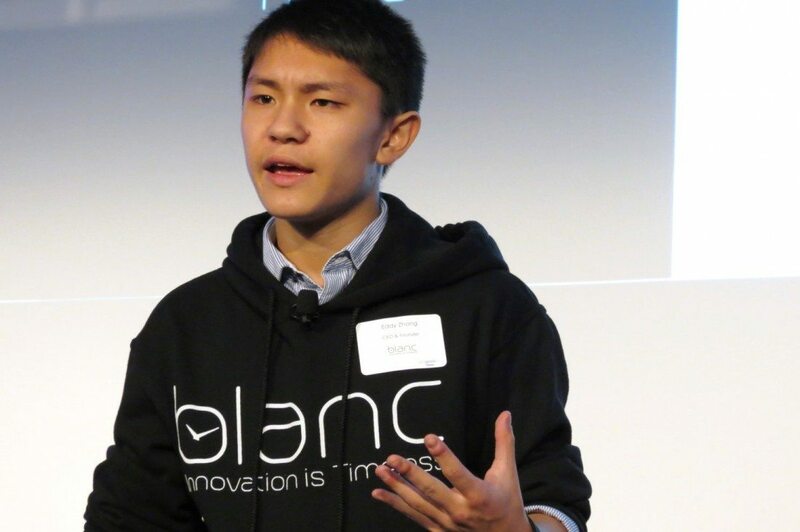 At last night’s Getgeeked gadget show in New York, CEO Eddy Zhong, a 17-year-old high schooler, showed off his startup’s Spark watch, which detects if someone may be dozing and vibrates to rouse them. This summer, Cambridge, MA-based Blanc ran a Kickstarter campaign that raised about $23,700 on a goal of $6,000 to fund the development of Spark. Zhong and his co-founders, also high school students, wanted to create a smartwatch that was different from what has already been seen on the market. “When we first heard about smartwatches, the Pebble and Samsung Gear, we thought they were incredible devices,” Zhong said. “But we didn’t think they were incredibly unique.” He said the features of many smartwatches merely replicate what smartphones can do. The Blanc team, Zhong said, came together with no business or engineering experience, but sought guidance to help them create a different sort of wearable device. In particular, they wanted to address the issue of staying awake in school, something each team member could relate to. They also saw the potential to reach a broader market. “We realized this is not just a problem with students, but with security guards who need to stay up overnight and emergency room nurses,” Zhong said. He also said people who suffer from narcolepsy, who can be struck by daytime sleep attacks, might want a device that could stir them. Spark uses sensors and algorithm-based motion tracking to detect when the wearer may be drifting off, Zhong said. The watch monitors how the user typically moves during the day and how they move when falling asleep. Spark vibrates with varying intensity based on how long it took the wearer to start dozing. The smartwatch has a full color LED backdrop, which Zhong said further differentiates it from Pebble and other devices that have black-and-white, electronic paper displays. Despite its color display, he said, Spark’s battery lasts longer than comparable devices and the team is working on further improving how long a charge lasts. The first idea the team came up with for a smartwatch was a bit extreme. They planned to create a device that zapped the wearer with a 50 volt shock to wake them up. Looking for an alternative way to solve the problem, some of Zhong’s friends among the faculty and students at MIT weighed in on the idea and helped develop the product. But just as the prototypes emerged, the original team started to crumble. “One kid got a girlfriend, one kid went off to college, another went to grad school,” Zhong said. Whittled down to just two people, the remaining team persisted with the idea and regrew the ranks. Blanc is taking orders now for Spark, which is priced at $49 each.